• People respond more palpably to opinions and reviews sent via Twitter and Instagram. In this age of “I want it NOW journalism,” this is the new method of reportage. Without pictures and snappy captions, even Facebook updates are too much work for moviegoers to get through. • I blog, therefore I am. The spoken word remains my most reliable means of figuring out the nuances of cinema, rather than snappy loglines. That seems to be a talent that escapes me somehow. • My Instagram coverage of the Sundance Film Festival (any picture posted Janaury 2013) might not be exactly what the Sundance press office wants representing them. I mean, where are the celebs? • Commuting every day from Salt Lake City to roll into Park City is not so bad. Having to leave the house every day by 6 AM to catch a good FREE parking space is not so good. • Food choices in Park City are generally bad. Ethnic food choices? Generally, REALLY bad. • And finally, getting into film screenings is not so bad — if you possess the right kind of accreditation. Among the more impressive selections from my Park City Week were (what else?) two skillfully drawn non-fiction features that took me from a community trying desperately to rebuild after a horrendous calamity; to a personal journey of a once-vital man now battling a debilitating, incurable illness. Zhao Qi, producer of past Sundance milestones LAST TRAIN HOME by Lixin Fan and CHINA HEAVYWEIGHT by Yung Chang, makes his feature directorial bow with FALLEN CITY, a graceful, carefully-observed look at the people of the mountain city of Beichuan, who survive the devastating 2008 earthquakes that leveled much of Sichuan Province. 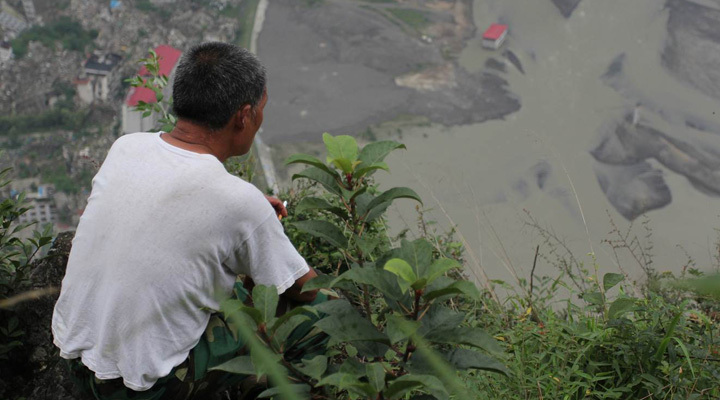 Compounded by a massive flood mere months later, Beichuan was a city truly in ruin. Through skillfully weaving the stories of three survivors from the town, FALLEN CITY observes the struggles of Beichuan and its people to rebuild. Riffing on recent Sundance masterpieces as Yung Chang’s UP THE YANGTZE (2008) and Lixin Fan’s aforementioned LAST TRAIN HOME (2010), director Zhao’s camera captures the breakneck construction of a new Beichuan, even as we see that the emotional scars of the townspeople are not so fast or easy to heal. A testament to the human spirit, FALLEN CITY was easily one of the more moving film-going experiences of the week. Just as moving — in fact poignant — is Desi filmmaker Jason DaSilva’s WHEN I WALK, a non-competition documentary that very well should have been in competition were it not, presumably, for DaSilva’s already impressive resumé of work. The director of award-winning works including OLIVIA’S PUZZLE, LEST WE FORGET, and a host of other short films, WHEN I WALK gets us caught up with what has been happening in the years since his 9/11 documentary LEST WE FORGET made the festival rounds in 2003 and 2004: stricken with a form of multiple sclerosis while on a family vacation in 2006, DaSilva undergoes various forms of treatment to stanch the spread of the condition, all to no avail. Finally, it is Jason’s mother who provides the tough love to turn his fortunes around — mother reminds son that as a privileged American, he had the opportunity to study art and filmmaking and he should use those gifts to his advantage. So turning the camera on himself, he does. As depicted in WHEN I WALK, Jason’s story is one filled with struggle, but one filled with a series of small miracles that sustain him and keeps him going. Using an artful combination of personal narrative, fly-on-the-wall observation, and expressionistic animation sequences, WHEN I WALK is emotional viewing, yet an inspirational experience.